Young children will love this David McKee story. No-one will listen to Bernard - they're always too busy. Too busy, in fact, to notice that Bernard has gone and a monster has taken his place! This is a dual-language hardback book with the full text printed in both Spanish and English. The high-quality colour illustrations, bilingual text and frequent repetition make this suitable for young children who are learning Spanish as a foreign language, as well as those who are learning to read and speak both languages in parallel. This book is a high-quality dual-language picture book, suitable both for children who are learning and reading Spanish and English in parallel and those being introduced to Spanish as a second language. 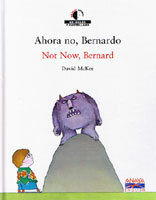 The Spanish in this text is aimed at very young children and so is fairly simple. It would be helpful for the parent / teacher to have a little knowledge of the language already as no pronunciation guide is included. This is a good translation of a well loved children's book. The repetition of phrases throughout enhances understanding of language and enables children to join in with the story, even on the first read.